> Blog > Business > Is Your E-commerce Site Seriously STILL in English Only? Is Your E-commerce Multi-lingual – or Mono-lingual? If you’re patting yourself on the back right now for being smart enough to install the Google Translate API on your site – move your hand upwards until it reaches your forehead. There – it is now placed properly for you to hit yourself with it. No, Google Translate does not count as professional language translation, or having a multi-lingual site, and it definitely doesn’t do anything for global accessibility. At this point, there should really be no need to “convince” any business that receives online revenue via consumer sales, whether B2C or B2B, that globalization is a smart move. It’s become an imperative in order for any company to truly grow and expand. Those that refuse to acknowledge the rest of the world in regards to business, trade, purchase and sales will simply be over-run by those who have long since taken up measures to internationalize their business outreach. For those who choose to ignore professional translation, localization and overall internationalization of not only their websites, but also product lines, B2B services, and any other pertinent e-commerce materials – well, industry competitors will gladly take your share of eGDP. And the hefty profits that come with it. For those of you putting off global expansion of your online business, consider this: e-commerce revenue from global sources this year will surpass U.S. consumer revenue by about 70-75%, with U.S. e-commerce revenue projected at around $212 billion, and global revenue projected at $820 billion for 2012. Those numbers will continue to get farther apart by 2013, while global economies flood internationalized markets. If your web business ignores the need for professional translation and localized multi-lingual accessibility, and therefore excludes every culture, economy and language other than those that speak English, you might as well be selling only to red-haired people. And that’s a generous analogy. What does it take for a website or a brand to have a good global presence, access and availability? The following criterion are a mix of Common Sense Advisory research on global brands, e-commerce customer behavior, as well as common components of successfully globalized enterprises online. There are a couple ways to use this metric as information about who and how many users your site is available to. Typically, it measures the percentage of the total global online user population that your site is available to. If your site is only available in English, your overall Availability Quotient (score) is pretty rotten. The more languages and overall online populations available for each stage of website user experience on your website, the higher your global availability, or “Availability Quotient” will be. However, according to Common Sense Advisory, a website should be translated and localized into at least 16 languages for it to be established as having an online global presence, and a decent global website score to match. 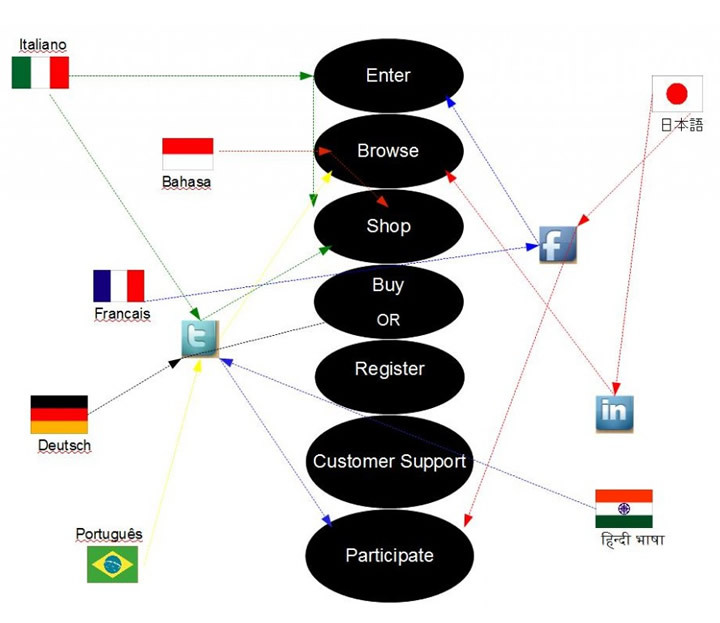 It is easy to think, there’s no way I need to translate and localize my e-commerce into 16 languages. But consider that there are 23 languages in the European Union alone, which doesn’t cover all European languages, nor does it include the world’s largest populations. While this term is often used generically, in this context it refers to a company, business or e-commerce presence across one single domain or several. For example, very large corporate giants like Coca-Cola and Nike, have websites that spread across many, many international domains. There is Coca-Cola.ru and Nike.au. Some companies may choose to translate and localize all languages on one singular company site – but this creates much, much less global web presence, which affects the overall global web score. This measures the total buying potential of a given online audience, or how much of the total global buying potential is represented by a particular country, audience or website. This can be calculated according to country by multiplying the total number of people with online access by the GDP (gross domestic product). Obviously, websites strive to be available to audiences with high WOW factor. For global website scoring, obviously the more WOW potential a site has, the higher its score. The better a website visitor can meet his or her user needs upon entering the site – and the less navigation it requires before that is possible – the higher the score of the site. Browsing may be the most critical point of user experience, especially in regards to the global user experience. Are all products and descriptions translated and localized? Is browsing easily navigable to your foreign language audiences? Is language translation and appropriate localization applied to designated landing pages of each individual target audience? Will a Russian user find the Russian translation of all browsing content with relative ease, and with localized navigation experience? E-commerce sites and those with defined conversion goals must have this step in user experience appropriated for each target audience. Shopping carts must be localized, if necessary, monetary conversions available, prices clearly marked with appropriate language translation or localization when applicable, and check-out processes clearly defined and logically set-up in accordance the localized needs of the user. Again, registering must have appropriate website translation and localization. All required information from targeted users should feel authentic, and email correspondences should all be appropriately translated and localized, both in their actual content, and insofar as email carriers and domains. In other words, email correspondence that is automated via registration should be available for more than Yahoo, Gmail, Aol, etc. If all other user components are sufficiently met up to the purchasing point, then targeted users are well on their way to conversion goals, and have already decided upon their purchases. As long as there are no abrupt changes, mistakes or sudden lapses in language translation or localized purchase processes, then this step should be completed easily. This may be the most complex of all website translation and localization needs, because for the most part, customer service and support cannot be automated with previously translated and localized texts, emails, landing pages, etc. If a business is not equipped with staff to handle foreign language users, then prepare in the best way possible. Set up FAQ sheet translations for targeted languages, and have customer support forms with equal translation and localization available, so that if nothing else, the user can send in his or her concern, question, complaint, etc, and it can be professionally translated from then on. Customer participation can be acquired easily enough through the aid of social media. With global social networks, this is even more true. However, it still takes some effort to reach out to your foreign language markets in their native language, via Twitter translation and other similar sites. Mobile website optimization can also play a part in obtaining a larger global audience and market. Since many users primarily access the web from their smartphones, companies who do not have mobile optimized websites may be missing some prime opportunities to convert visitors. If your website is hard to navigate and loses a lot of functionality on a mobile web screen, visitors will not stick around, no matter what language they speak. The diagram below illustrates the various levels of customer experience in e-commerce, and how the various levels are arrived at when proper langauge translation and localization is used at all stages of entry, shopping, buying and customer behavior thereafter. It also illustrates how global consumers can find your site using tools like social media, Twitter translation services, marketing localization, website language translation, and so on. However, if your business isn’t successfully searched and found online in anything but English, nor is it made available to audiences other than native English-speakers – well, let’s just say your piece of the pie is mighty small. So, what would your website score be, on the global availability test? Successful planning for drug and medical Web localization Website Translation and Website Localisation Top Ten Languages on the Internet A Business Approach To Translation Services Provide English-french Translation and Watch your Market Grow!